PRICES ARE ACTUALIZED BY THE RUBLE COURSE on May 21, 2015 (0.45 CPC). PRICES MAY CHANGE. REFINE AT THE BOOKING. 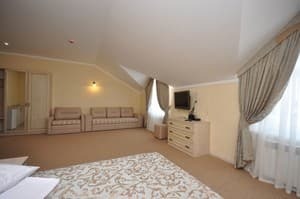 The boutique hotel "Evpatorion" is a cozy private hotel, located in the resort town of Zaozernoye, which is famous for its sandy beaches and therapeutic sanatoria. The hotel is 450 meters from its private beach, equipped with sun loungers, canopies, and children's play equipment. "Evpatorio" combines high-class service with modern conveniences. 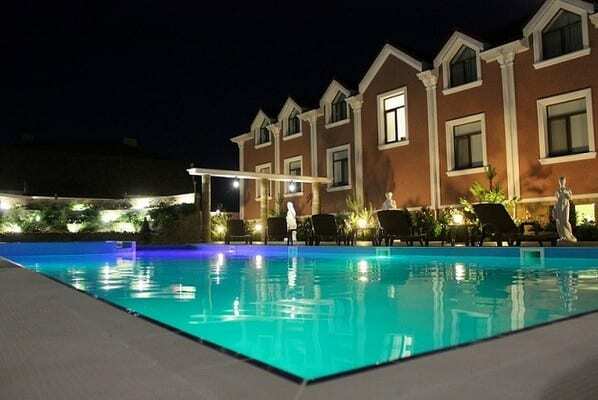 There are 20 comfortable rooms with elegant interiors, Wi-Fi coverage throughout the hotel, free parking, heated pool, outdoor bar with barbecue, children's room and outdoor playground. On the territory of the boutique hotel there is a restaurant with author's cuisine in antique style, designed for 50 seats. All this makes the hotel "Evpatorion" an ideal place for individual and family rest. 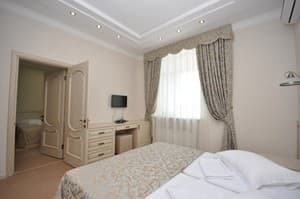 Description of the room: Standard room that includes a wardrobe, a double bed (or two single beds), a chair-bed, a refrigerator, a desk-chest of drawers. This room can accommodate 3 people. Description of the room: Spacious room consisting of: wardrobe, double bed (or two single beds), armchair-beds, table-chest of drawers. The room can accommodate 3 people, it is possible to install a euro clamshell for an additional fee. 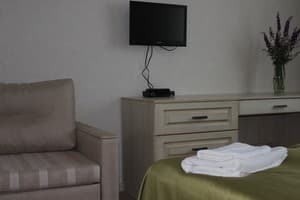 Description of the room: A large comfortable room that includes a kitchenette with a fridge and microwave, a wardrobe, a double bed, a sofa bed, a chair-bed, a desk-chest of drawers. The room can accommodate 5 people, it is possible to install a euro clamshell for an additional fee. 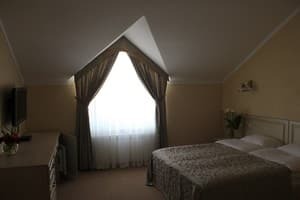 Description of the room: Family room consisting of 2 adjoining rooms connected by a door. In each room: a wardrobe, two double beds (or two single beds), a chair-bed, a desk-chest of drawers. This room can accommodate 6 people. Baby bed - 50,00 UAH / day, an euro clamshell 100,00 UAH / day. Accommodation of children without extra bed is free of charge. From Evpatoria, fixed-route taxi №119, stop - "Faton". There is a possibility to book a transfer.